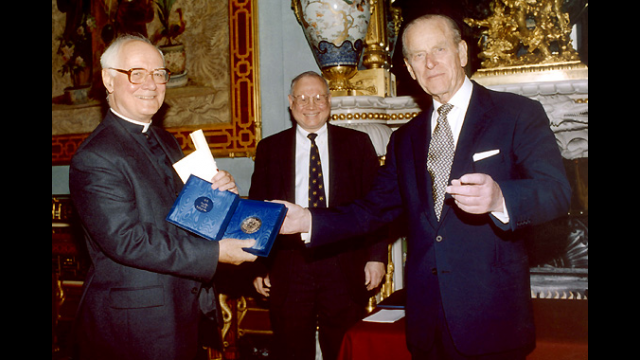 Dr. John Polkinghorne (left), who will speak at Baylor University's Dirac Centenary Conference, received the 2002 Templeton Prize from the Duke of Edinburgh in a private ceremony at Buckingham Palace on April 29. Baylor University will be the site of some of the top academic conferences in North America this fall. World-renowned scholars will discuss such diverse issues as theoretical physics and the history and philosophy of science, the changing culture of music and the church, and the integration of faith and learning into economic scholarship. Researchers and students from various disciplines will honor the centennial birth of one of the greatest theoretical physicists of the 20th century, Paul Dirac, with the Dirac Centenary Conference Sept. 30 to Oct. 2 in the Cashion Academic Center on the Baylor campus. For a complete conference schedule, go to https://www.baylor.edu/dirac/. Dirac, who was born Aug. 8, 1902 and died Oct. 20, 1984, spent much of his career as the Lucasian Professor of Mathematics at the University of Cambridge - the chair once held by Isaac Newton - before "retiring" to a teaching position at Florida State University. Along with Erwin Schrödinger, Dirac was awarded the Nobel Prize in physics in 1933 for his "discovery of new fertile forms of the theory of atoms and for its applications." His contributions to physics have profoundly shaped the development of physical theory and have ongoing significance to this day. Baylor's Dirac Centenary Conference, one of only four in the world, will be an interdisciplinary evaluation of Dirac's seminal contributions to the methodology and progress of 20th century physics. Scheduled speakers include Sir Roger Penrose of Oxford University, Dr. John Polkinghorne of Cambridge University and Professor Gordon Kane of the University of Michigan, among other well-known scholars. Before the conference begins, Penrose will deliver a campus lecture on "Why We Need an Improved Quantum Mechanics" from 2 to 4 p.m. Sept. 30 in the Cashion fifth floor conference room. The lecture, which is free and open to the public, is sponsored by the Baylor departments of physics, mathematics, engineering and computer science, neuroscience and philosophy. That evening, Polkinghorne and Professor Richard Dalitz of Oxford University will present the opening session on "Paul Dirac: The Making of a Physicist" from 7:30 to 9:30 p.m., also in the Cashion Academic Center. Plenary sessions will be held Oct. 1-2 on "Dirac on General Relativity and Quantum Gravity," "Relativistic Quantum Mechanics and Quantum Field Theory," "Magnetic Monopoles and Mathematical Innovations," "Supersymmetry and Superstrings" and "Dirac's Mathematical Heuristics and Philosophy of Physics." The registration fee for the conference is $150 per person. The conference sessions are free for all Baylor faculty, staff and students with a valid Baylor ID. For more information, contact the Office of the Vice Provost for Research at (254) 710-3763 or Dr. Bruce L. Gordon, acting director of the Baylor Center for Science, Philosophy and Religion and assistant research professor in Baylor's Institute for Faith and Learning, at (254) 710-4175 or Bruce_Gordon@baylor.edu. Baylor University's Center for Christian Music Studies will present "Music and the Church: Relevance in a Changing Culture," an Oct. 7-9 symposium sponsored by the Billy Ray Hearn Endowed Symposium on Christian Music. For a complete conference schedule, go to https://www.baylor.edu/christian_music/. Four sessions also will be available live on the web at https://www.baylortv.com/. The Hearn Symposium was established at Baylor to address issues in Christian music, to explore the role of Christian music in culture, and to ensure dialogues and facilitate interaction between church musicians, pastors, Christian music industry executives, artists and composers. The inaugural event is intended to provide a place to reflect, worship, ask questions and be renewed in spirit for more effective service. George Barna, founder and directing leader of Barna Research Group, will deliver the keynote address at the Oct. 7 opening session in Jones Concert Hall in the McCrary Music Building. Barna will present findings of a survey commissioned by the symposium, which will assess the current state of music in worship, including types of music currently used, attitudes toward music and worship, ways churches deal with music-related challenges, and more. Other conference participants include recording artists Charlie Peacock, Twila Paris, Chris Tomlin and Louie Giglio; Hearn, president and CEO of EMI Christian Music Group; Don Cason, president of Word Music; Peter York, president of the Sparrow Label Group; and academic and worship leaders from throughout the country. Plenary sessions with major presenters from the fields of church music, academia and the Christian music industry will provide opportunities for in-depth inquiry into elements which affect all aspects of worship. Break-out sessions will include special interest topics such as "Youth/Gen X/Y," "Music and Culture," "Christian Music in a Theological Context" and "What's New in Congregational Music." Worship services will be held at 7:30 p.m. Oct. 7 and 8 in Jones Concert Hall. The Oct. 7 service will feature congregational music led by Al Travis, Distinguished Professor of Organ at Southwestern Baptist Theological Seminary, and Baylor choirs. The next evening's worship service will focus on praise and worship led by Peacock, Paris, Tomlin and Giglio. The $100 registration fee includes all plenary, break-out and worship sessions. For more information, contact the Baylor Center for Christian Music Studies at (254) 710-2360. Baylor's department of economics in conjunction with the Institute for Faith and Learning will host "Christianity and Economics: Integrating Faith and Learning in Economic Scholarship" Nov. 7-9. Jointly sponsored by Baylor's Pruit Memorial Endowment and the Lilly Fellows Program in the Humanities and Arts, the event will bring together the annual Pruit Memorial Symposium and the second annual Lilly National Research Conference. For a complete conference schedule, go to https://www.baylor.edu/2002conference/. "Christianity and Economics: Integrating Faith and Learning in Economic Scholarship" will address the challenges and opportunities facing Christian economists from a broad range of denominational perspectives and philosophies of political economy. The symposium will be organized around three broadly defined roles of the economist, scholar, philosopher, and advocate. Conference participants will include George M. Marsden, Francis A. McAnaney Professor of History, University of Notre Dame; Rebecca M. Blank, dean of the Gerald R. Ford School of Public Policy and the Henry Carter Adams Collegiate Professor of Public Policy, University of Michigan; Judith Dean, international economist, U. S. International Trade Commission; David Gushee, Graves Professor of Moral Philosophy and senior fellow at Carl F. H. Henry Center for Christian Leadership, Union University; Glenn C. Loury, Professor of Economics and director of the Institute on Race and Social Division, Boston University; Robert H. Nelson, School of Public Affairs at the University of Maryland; Michael Novak, George Frederick Jewett Scholar in Religion, Philosophy, and Public Policy at the American Enterprise Institute; Earl Grinols, professor of economics, University of Illinois; John Tiemstra, professor of economics, Calvin College; Ken Elzinga, professor of economics, University of Virginia; and Charles K. Wilbur, Emeritus Professor of Economics and Fellow at the Kroc Institute for International Peace Studies, University of Notre Dame. Among the concurrent session topics are "Love and Economics: Why the Laissez-Faire Family Doesn't Work," "Faith-Informed Scholarship: Some First Principles," "The Economist as Philosopher," "Understanding Markets as Both an Economist and a Christian," "Anatomy of Racial Inequality," "The Theological Meaning of Economics" and "No Compromise: The Christian Economist as a Mainstream Scholar." A $150 registration fee will cover all conference materials and most meals. After Sept. 30, the registration fee is $200. For more information, contact Dr. John Pisciotta, professor of economics in Baylor's Hankamer School of Business, at (254) 710-6224. For registration information, contact Kristen Sanford, conference coordinator in the Institute for Faith and Learning, at (254) 710-4805.